Tristar Investigation founder Bruce Robertson was hired to track down the person who shot two endangered California Condors. In 2009 private detective and Tristar Investigation founder Bruce Robertson was hired to track down the person who shot two endangered California Condors. This was the first time a private eye had been assigned to this type of case. The story was featured in the New York Times and numerous other publications throughout the U.S, including the Los Angeles Times and San Francisco Chronicle. Robertson’s search covered 7,000 square miles of the Condor range in Central California. The New York Times reporter spent a long day with Robertson as he worked undercover throughout the dusty hills of the Salinas Valley trying to dig up information on the shooter. 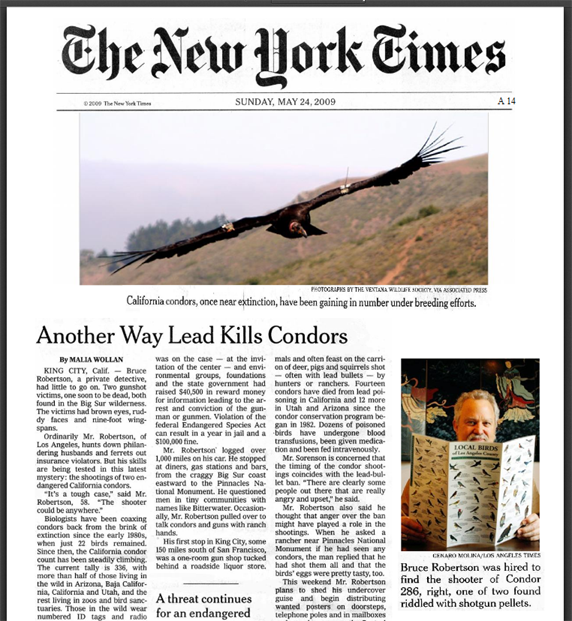 Robertson discovered quite a bit of hostility from the local community which was upset over lead ammunition restrictions related to the Condor preservation.